It’s a very powerful feeling to visit a place that’s been on your bucket list for half your life. 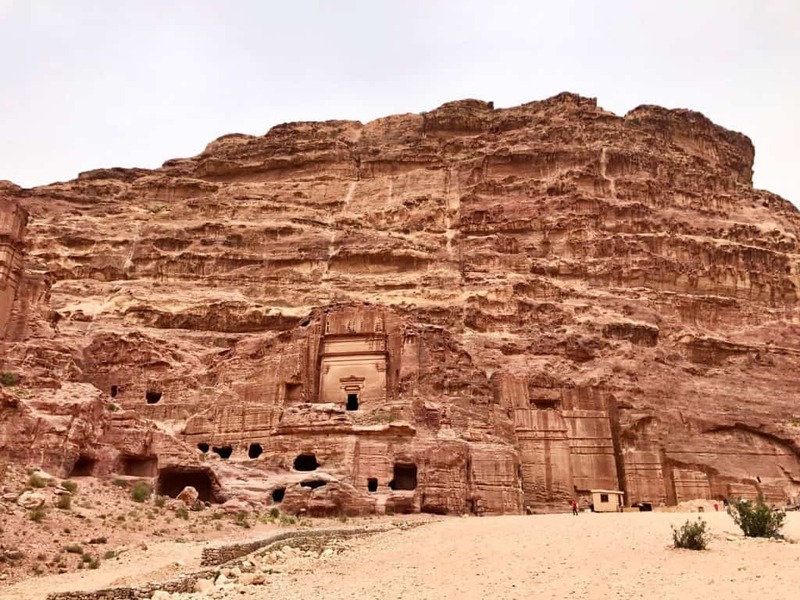 One of the New Seven Wonders of the World, the Lost City of Petra has fascinated me since I was a young teenager, and has been #1 on my travel bucket list since I was probably 14 or 15. 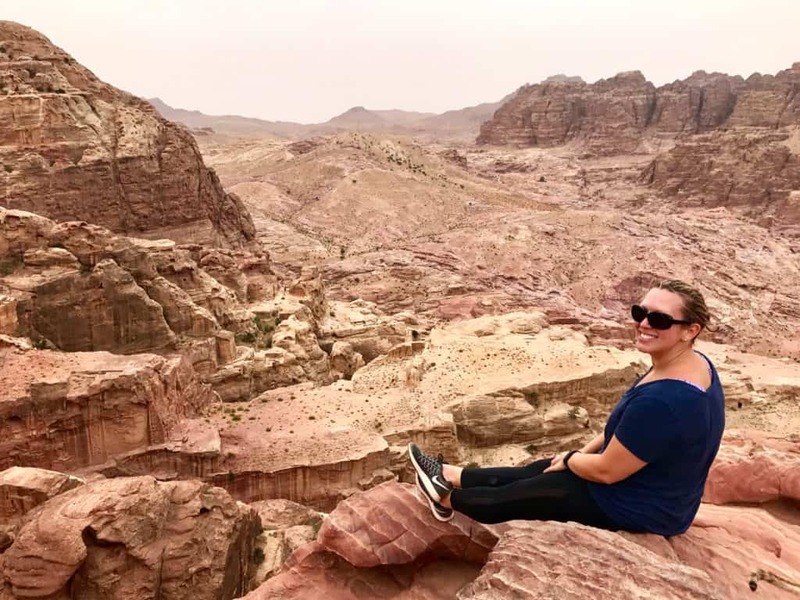 So when my dad and I were planning our trip to Israel, I knew without a doubt that our itinerary had to include a couple days in Jordan to visit Petra and Wadi Rum. I always worry that an experience like this won’t live up to my expectations, that I’ve hyped it up too much in my mind. But there was absolutely no way that Petra wasn’t going to blow my mind. And boy, did she deliver. 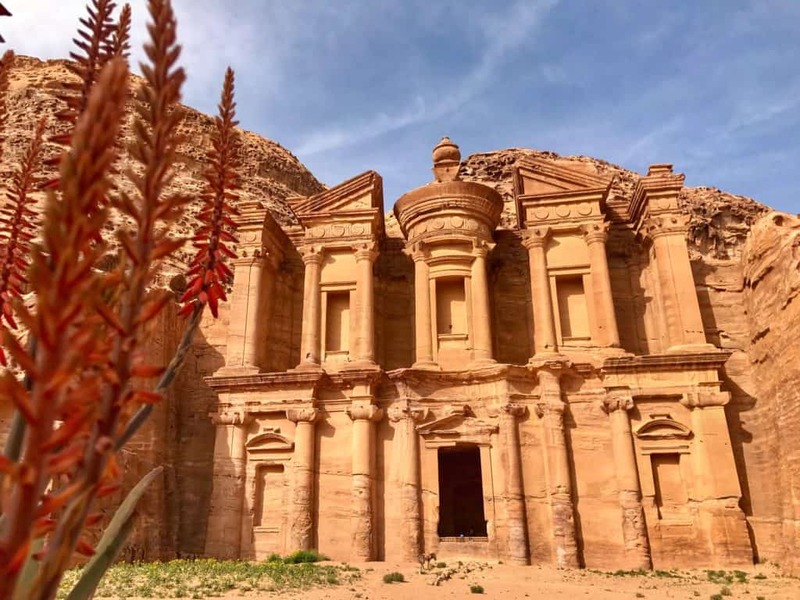 Two questions I get asked all the time are whether Jordan is safe to visit, and whether it’s possible to visit Petra self-guided rather than with a tour group. And the answer to both is YES! In terms of safety, obviously bad things can happen anywhere, and Jordan certainly suffers from “crappy neighbor” syndrome. But the country itself is one of the safest in the Middle East, has good infrastructure (paved roads, etc. ), and I felt very comfortable and welcome there. It’s not recommended to go to near the areas bordering Iraq and Syria (the aforementioned neighbors), and obviously check the news and U.S. travel warnings prior to your visit, but as long as you’re staying in the tourist areas such as Amman, Petra, Wadi Rum, Wadi Mujib, etc., you should be okay. Do I need a guide or a tour? In terms of visiting Petra by yourself, it’s totally possible and isn’t hard at all. There are times when having a tour package (including a driver) can simplify things, but it’s certainly not a requirement. 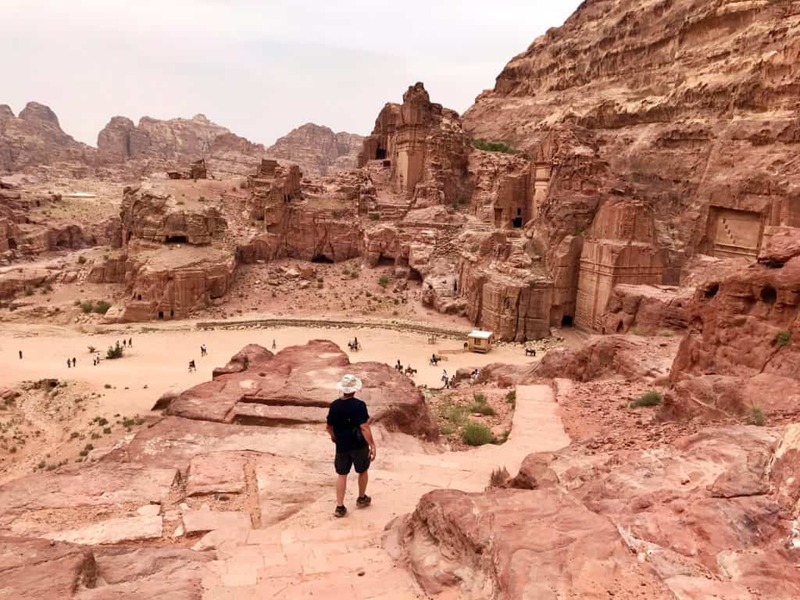 Below I’ve laid out everything about how my trip went, some things that didn’t go quite as planned, and how you can plan your own visit to Petra. One option you do have is to hire a guide at the entrance. If we’d had enough time to do it justice, I would have definitely considered that, even though I’m not a big fan of guided tours. However, the history is so rich and the signage is minimal (something I’m thankful for, as a photographer), so there’s no question that you’ll get more historical insight from a trained guide. And they can show you all the best picture spots! 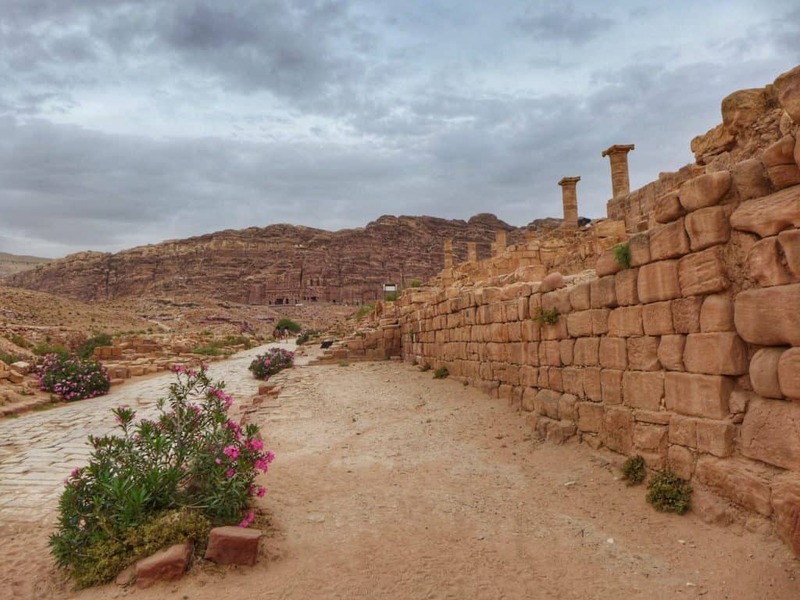 Pro tip: if your itinerary can swing it, I recommend planning for two days in Petra. 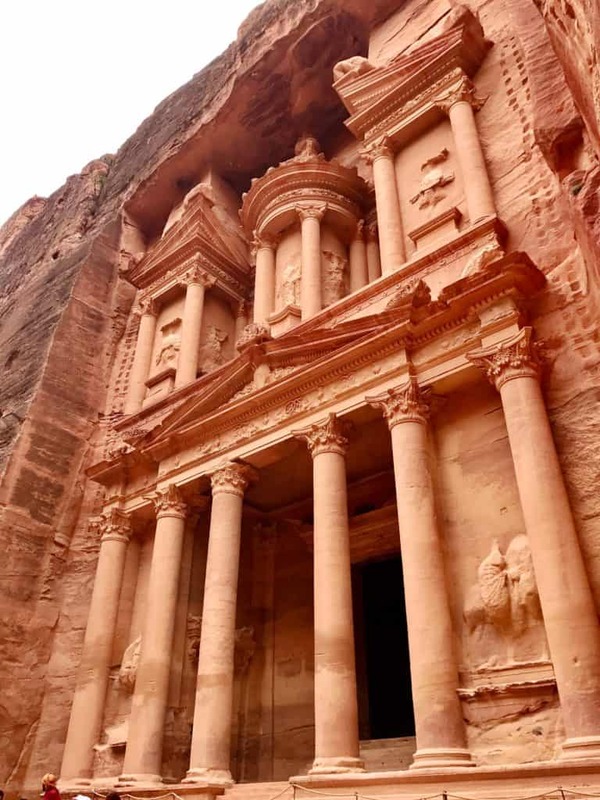 The price for a two-day Petra ticket is 55 Jordanian dinar (JOD), vs. 50 for one day (both with overnight stay). If you’re only doing one day and not staying at a hotel overnight, then the price is a steep 90 JOD. 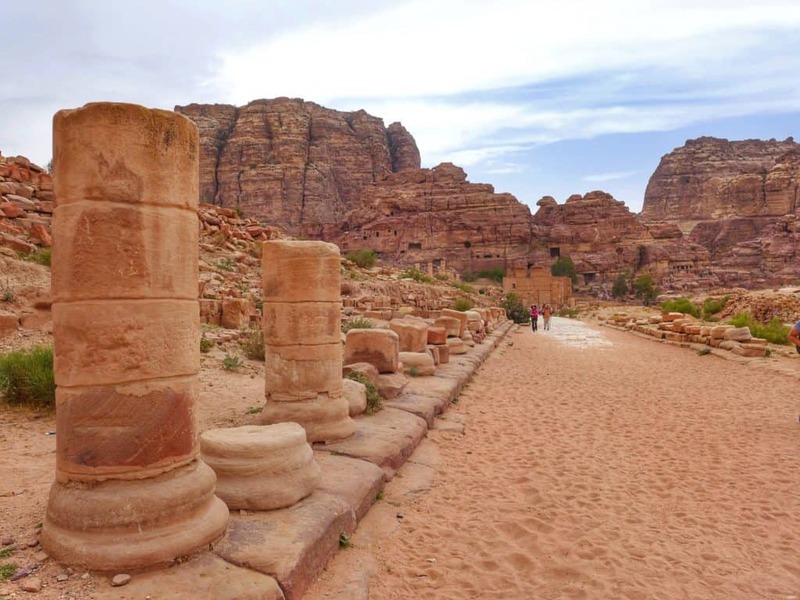 Planning a trip to Jordan? 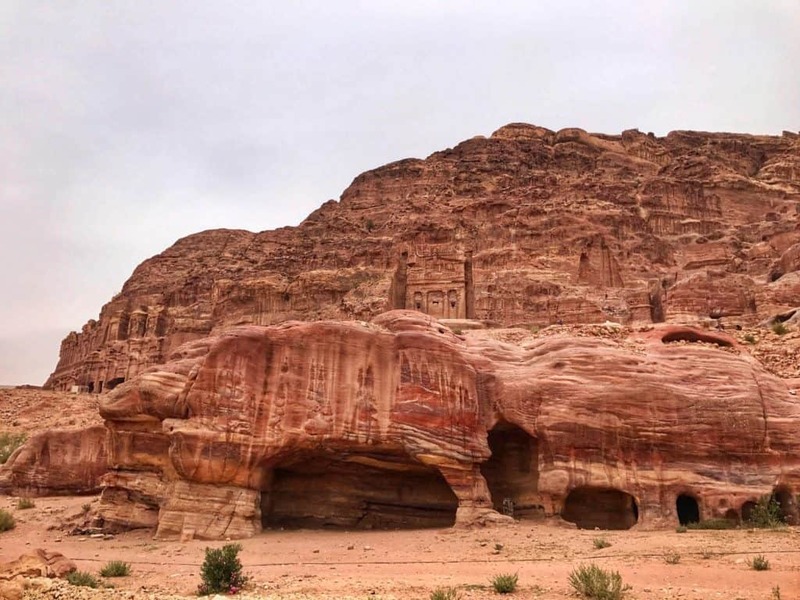 Here’s a post on visiting Wadi Rum to help plan your visit! ZigZag on Earth has a fairly simple map just to give you an idea of the order of things (distances not completely to scale). To hike to the High Place of Sacrifice, the trail starts between the Theatre and the Colonnaded Street (I believe). When you first enter the park, you’ll walk for 10-15 minutes down a boring gravel hill before reaching the canyon walls known as the Siq. I was totally obsessed with the undulating striped stone walls, how they curved and dipped. There’s something very mysterious about walking through there, and you don’t have to stretch your imagination to picture caravans of spice traders trudging through. The Siq is also totally massive, which you can see from these pictures (look at all the tiny people!). Every corner I turned, I kept thinking that *this* was the one where I’d get my first glimpse of the famous Treasury. But the Siq is way longer than you’d think. In total, the walk from the park entrance to the Treasury is anywhere from 20-45 minutes (depending on how fast you walk). 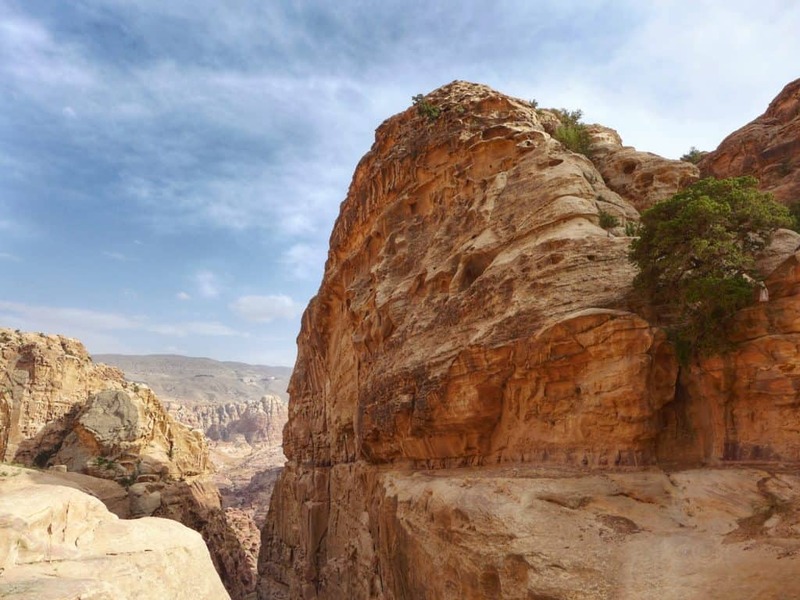 If you’re visiting Jordan, Israel is the perfect pairing—here are ideas to inspire your itinerary! The Siq ends abruptly, opening up into a big plaza dominated by the iconic Treasury building (made famous by Indiana Jones). It doesn’t matter how prepared you are for the view, it is breathtaking. It’s also absolutely crowded and chaotic, with everyone trying to get selfies and tons of locals selling cheap jewelry or camel rides. 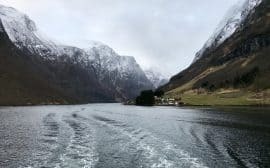 But if you know how to time it right, you can have it all to yourself (tips for that at the end of this post!). The intricacy and sharpness of the carving is absolutely unreal up close. Just…HOW??? Next you’ll walk along the Street of Facades, which is just a ton more houses and buildings carved into the rock face. That’s the thing about Petra, it’s so much more than just the Treasury (and I still only skimmed the surface since we only had half a day). There’s also a Roman amphitheatre, small but impressive. Full transparency: we didn’t make it. And if you’re pressed for time, I’d recommend skipping this and focusing on other sights (like the Royal Tombs, which we didn’t have time for). We started on the hike, but it was really taking a long time and was quite a challenging hike, and we were beginning to get worried about time. We arrived at Petra just after lunchtime, and since this was the first thing we attempted after seeing the Treasury, we were worried it would end up taking most of the afternoon. The path entrance isn’t marked at all, so you have to know what you’re looking for. After the Treasury you’ll keep walking through the Street of Facades and then past the amphitheatre. Then you’ll round a corner, which opens up into a kind of town square or plaza (which you can see below, the view from above it). The stairs leading up are immediately on your left when you round the corner, next to a little souvenir stand. Make sure you take a minute as you climb the initial steps to look backward, since the view is pretty cool! Then continue on the path and climb, baby, climb. After you pass the amphitheatre, you’ll come upon the Colonnaded Street, with Roman column ruins lining the way to a cool gate. I loved the pink flowers that popped up every so often, adding some color to a fairly monochrome landscape. Dad and I were absolutely famished at this point—it was probably 3:00 and we still hadn’t had lunch, nothing since breakfast at the Bedouin camp in Wadi Rum. We were past the Colonnaded Street, where you’d take the path up to the Monastery. There’s a well-known restaurant called The Basin here, with a buffet. We looked it over but it looked sad and generic, and at $25 per person we just weren’t feeling it (plus we were short on time). So we sat down in the restaurant’s garden and scarfed some KIND bars in the shade, prepared to just power through til dinner. Then we looked across the way, kind of catty-corner, and saw a small, unassuming restaurant. We couldn’t even tell for sure if it was open. We checked it out and found a simple, affordable little place, where they offered us a packed lunch of freshly-fried falafel, pita, chicken salami, yogurt, fruit, and more for only $7! One was enough for the both of us. We packed it up and then started to head to the Monastery, but were waylaid by some enterprising locals. I had not planned on doing any donkey or camel rides, but we were running short on both time and energy. 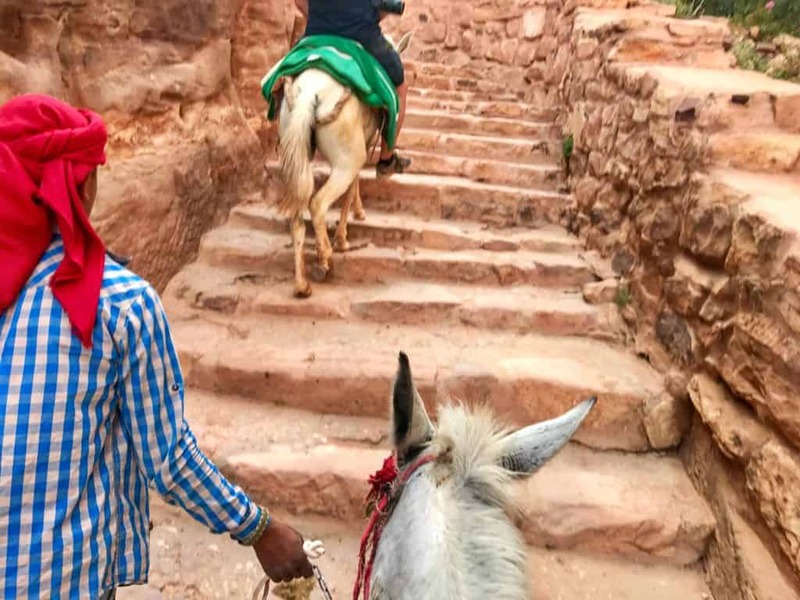 We were super sore from our hiking in Wadi Rum and my dad’s hip was killing him, so he asked if we could ride a donkey to the Monastery vs. climbing the 800 steps. The guys below were hanging out right outside the restaurant and we finally agreed on a price. 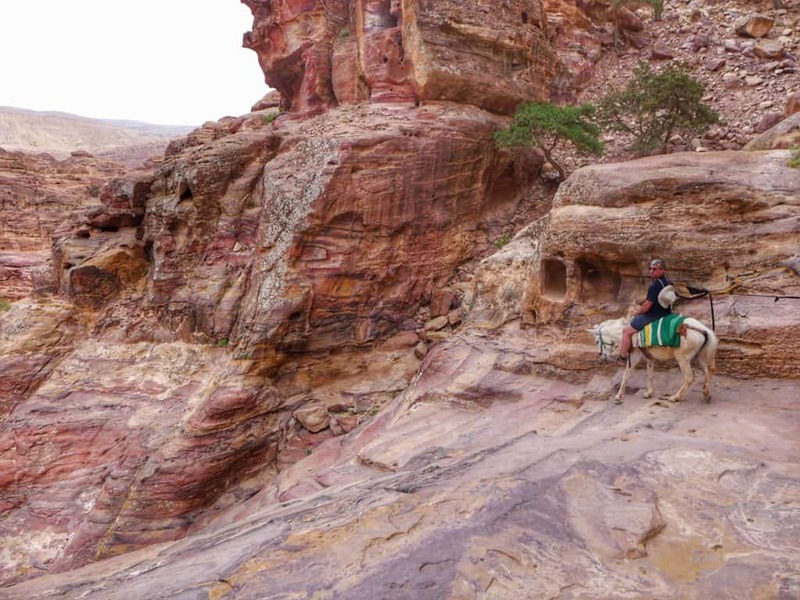 I’ll be honest, I have very mixed feelings about the animal situation in Petra (and many tourist destinations, for that matter). 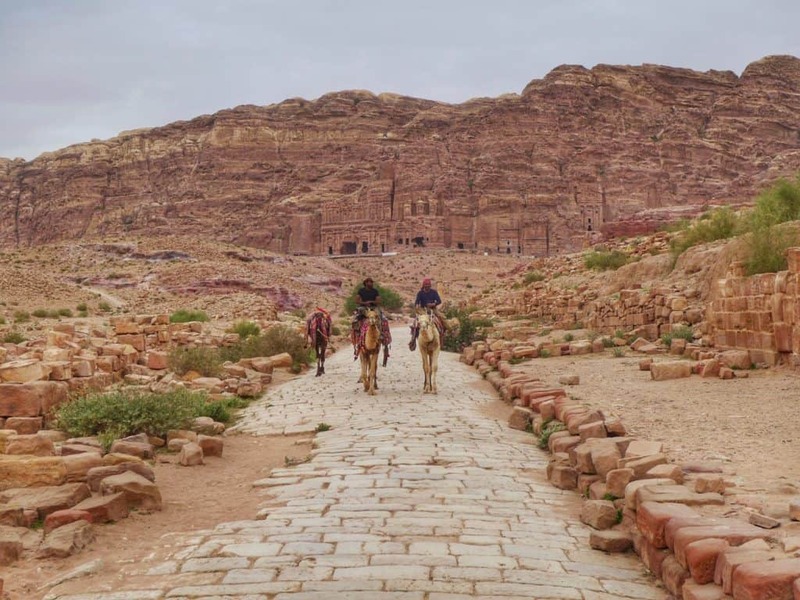 On the one hand, from growing up on a farm I have a fairly practical utilitarian perspective on animals, but I’ve also heard a lot of negative stories about the treatment of animals in Petra. Overall I’d say go with whatever feels right to you. We were in a bit of a bind, and I will say that both of our donkeys seemed well cared-for (and quite feisty). But I definitely saw some horses and donkeys that looked a little scrawnier. Jordan is trying to improve the situation of the animals here and elsewhere, so if you see one being mistreated please report it to the Visitor Centre, Tourist Police, or park rangers. The little dude on the left above is Egel, he was our guide. Don’t be fooled by his brooding look there, he was a charming guy, probably early/mid-teens and very chatty, with a sweet smile. He led me and my dad up the stairs on our donkeys. I had already learned from horseback riding in Costa Rica that my hips do not lie—they don’t like being on a horse AT ALL. So mostly I was trying to stay on through the steep trails and get my donkey, Shakira, to keep up with my dad’s. We stopped about 5 minutes from the Monastery, at a little tent shop run by a friend of Egel’s. He invited us to have some hot sweet tea (one of my favorite things about Jordan) and we chatted. I bought a beautiful handmade (or at least supposedly handmade) scarf but didn’t feel pressured to. It was an enjoyable break after all the hiking and heat and dust. But guys, the Monastery. I mean…why doesn’t it get the same hype as the Treasury??? I’m totally in love with this, it was easily my favorite thing that we saw in Petra. It was also the only 30 minutes all day that we had beautiful blue skies. The rest of the day was kind of overcast and blah (which made getting good pictures more challenging). And since it was getting to be late afternoon, we had the place to ourselves. *Sigh* But eventually we had to head back down. And boy, down was even dicier on a donkey. I was amazed at how sure-footed the donkeys were! Look at that pic of my dad—it’s so steep! And this picture is about 30 seconds before Shakira—who was kind of a spicy wench—tried to steal a bag of garbage from a shopkeeper, and wouldn’t let anyone tell her no. It was getting near closing time by the time we got to the bottom, so we didn’t have time to go to the Royal Tombs. I was really bummed about that. There are some amazing views from there, though, so I recommend going! 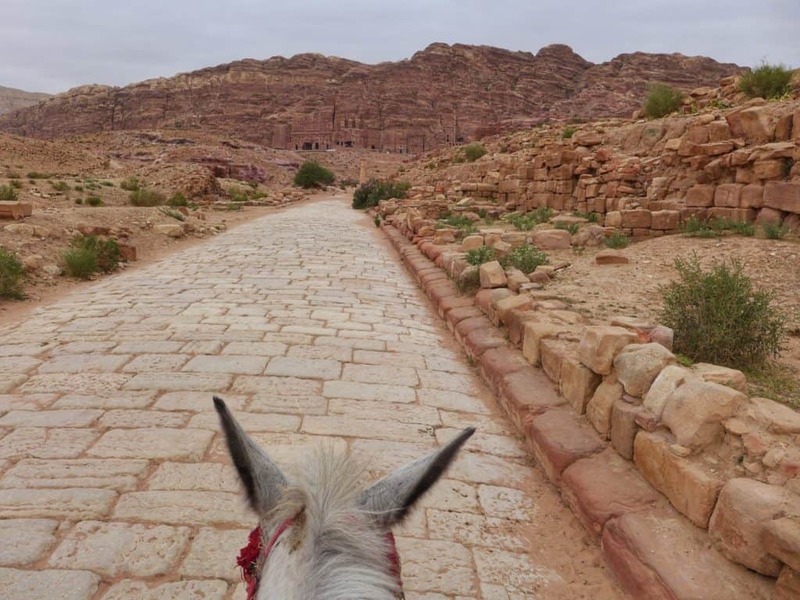 We actually rode the donkeys almost all the way to the Treasury because I didn’t have any cash left on me (you can read why in the tips below) and we needed one of Egel’s shopkeeper friends to use my credit card to get me cash. Cash is your friend, make sure you have plenty! Dad and I started to head back, and when we reached the Treasury something magical had happened—all the tourists were gone! We could take pictures to our heart’s content, and we even discovered the cool picture viewpoint in the right-hand pic below. 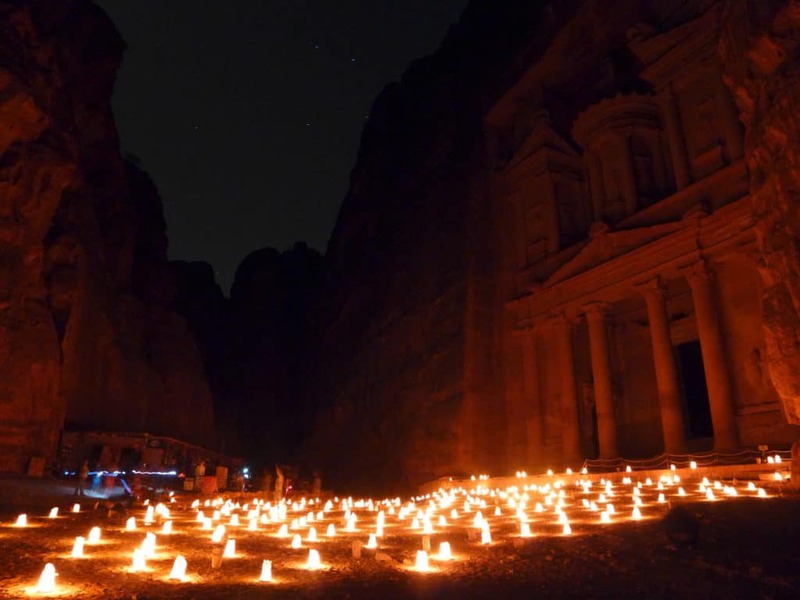 They were already getting the lanterns set up for Petra by Night, which we were planning on attending. I was SO bummed to find out that we could have actually stayed in the park and just bought our tickets there (or bought them ahead and brought them with us). This would have let us sit, have dinner and re-hydrate, and then get our own pictures of the glowing lanterns before the crowds arrived. Unfortunately our hotel owner was (kindly) buying them for us, so we had to go back to the hotel to pick them up. I was so sad, and want to pass that tip along so others can take advantage! But, the one upside to us heading back to the hotel before Petra by Night was that we ate dinner at our hotel and it was AMAZING! It was a traditional Jordanian dish called mansaf. When the owner (who was quite the flirt) began his description with “chicken that has been boiled for hours…”, I was like, “yeaaah, maybe not…”. But it is absolutely delicious tender boiled chicken with saffron rice, toasted nuts, parsley, fermented yogurt, and some kind of yummy thin creamy white sauce. It’s sooooo good and I strongly recommend you find some while you’re in Jordan! 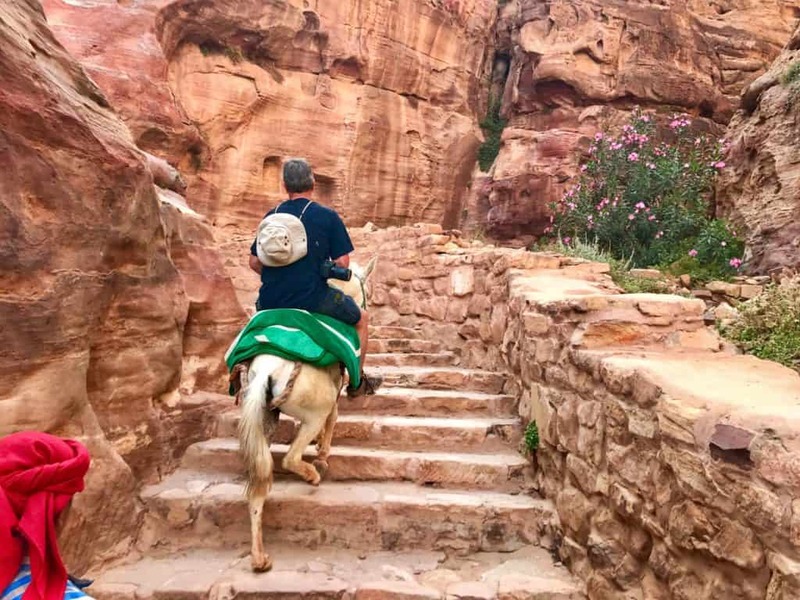 Dad’s hip was still really bugging him so I headed back for Petra by Night on my own (our hotel owner shuttled me and some others down there). I’ve written a whole other post on how mesmerized I was by the experience of Petra by Night and my tips for getting the most out of it, so I won’t go into tons of detail here. But I absolutely loved it. 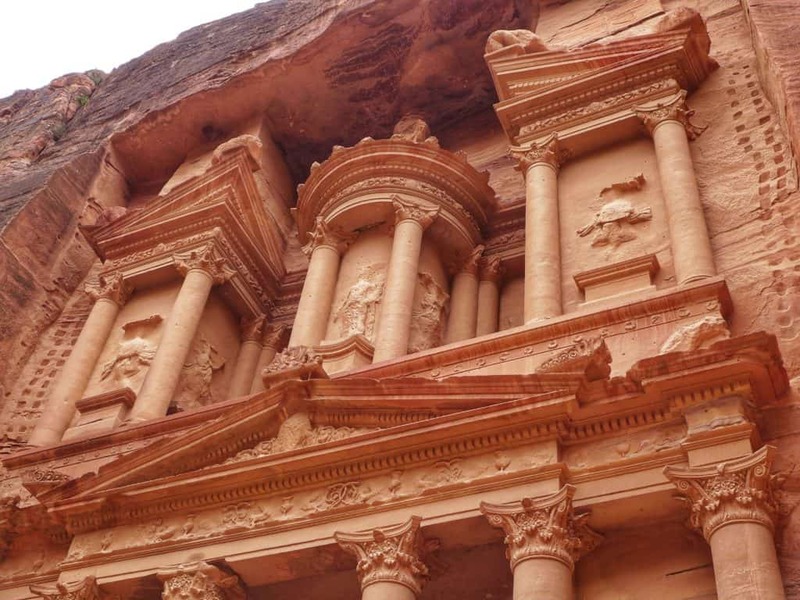 So, I pretty much wrote a novel, but I hope you’re inspired to visit Petra yourself. 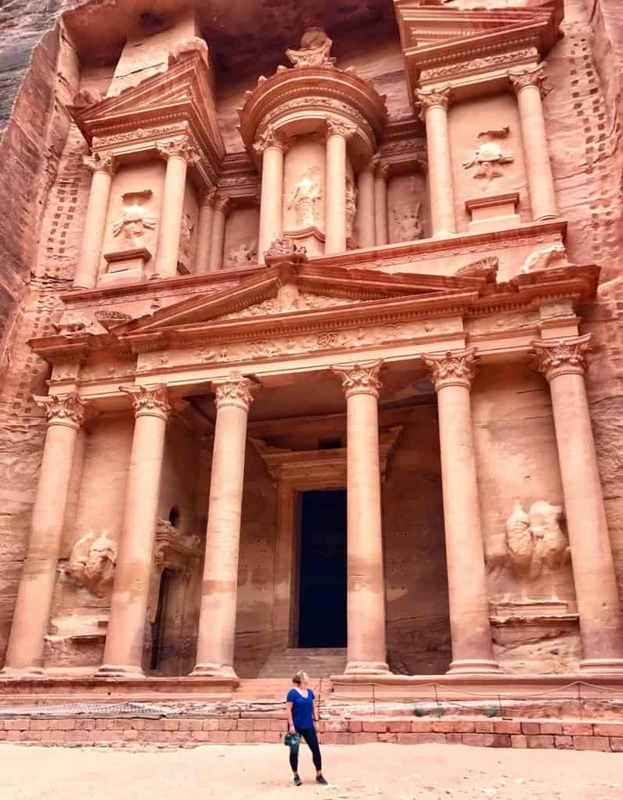 Now, as promised, here are my tips for planning your own visit to Petra! 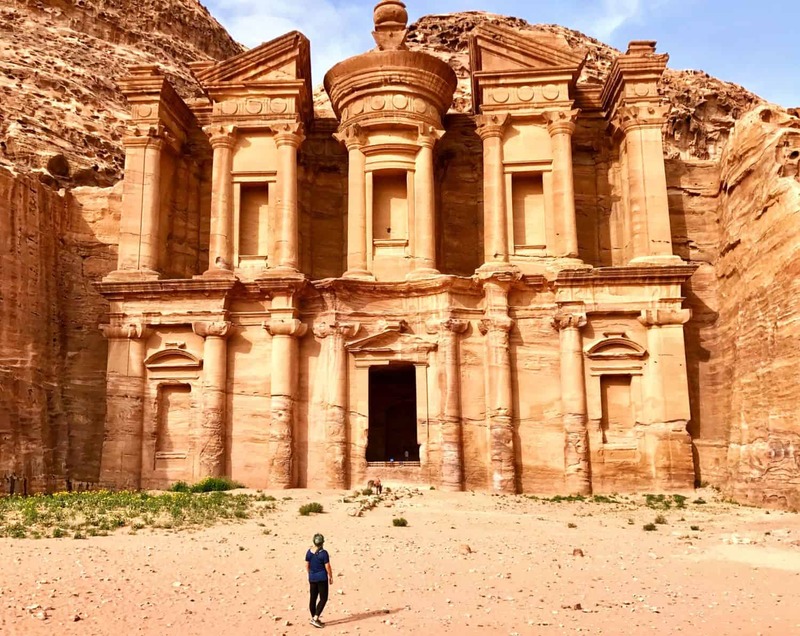 I also wrote a detailed post on how to plan an epic 7-day Israel and Jordan trip. Okay, y’all, let’s do this…this is kind of epically long, but I wanted to give you the full lowdown. 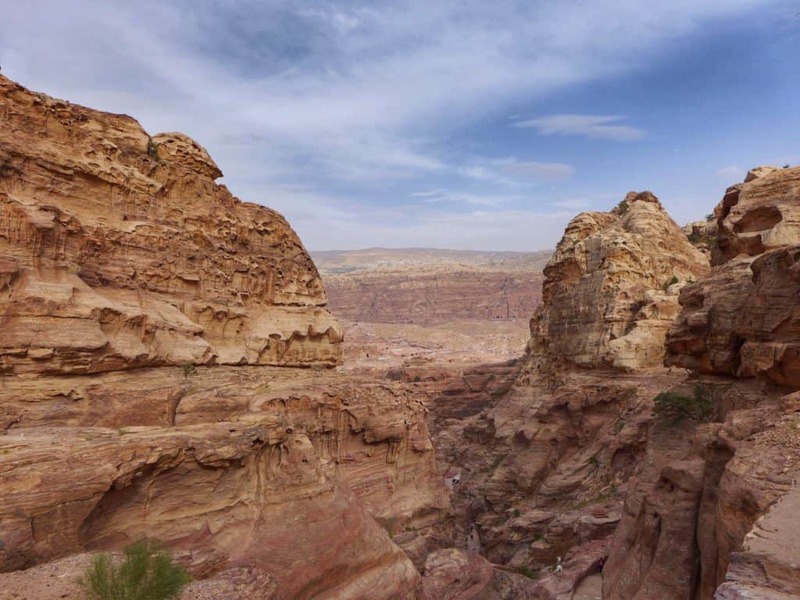 If you’re trying to do Petra as a day trip and not staying overnight in Wadi Musa, the ticket price is 90 JOD (1 JOD is about $1.41 USD right now). If you’re staying overnight in a hotel, the one-day fee is 50 JOD and two-day entry is 55 JOD. So I recommend visiting for two days (even two partial days), which will allow you to see more and also get photos in both afternoon and early morning light, when crowds are lightest. The website breaks it down even more, including guide costs. If you stay until right before the park closes, the crowds will be gone and you can get as many pics as you like in front of the Treasury (like the ones toward the end of this post). We took those around 5:00 or 5:30pm and we were the only ones there. 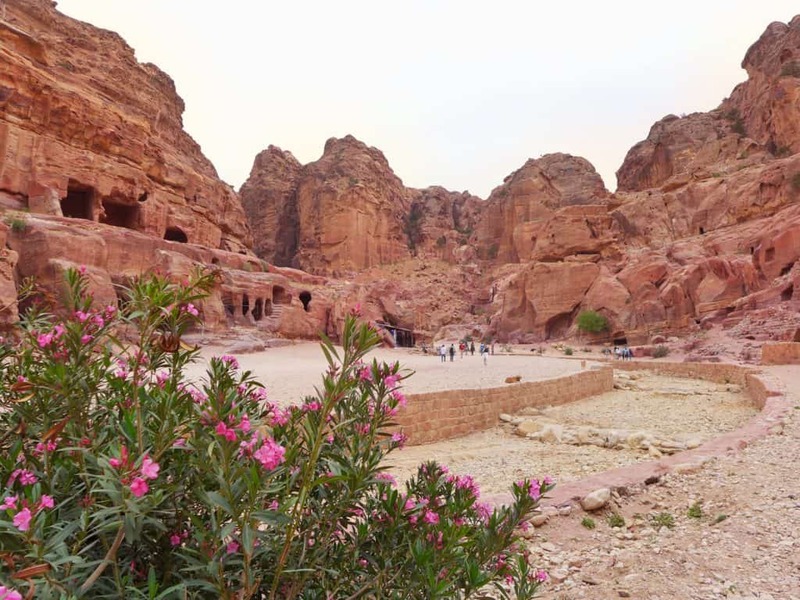 If there’s one thing you need to know, it’s this—if you’re visiting Petra by Night as well, you can stay in the park while they set up, and get pictures in the dark before the crowds arrive. You can also try to get there early in the morning, for interesting light and almost no crowds. The park should open around 6:00am (though I’ve heard it’s a bit fluid). This is true of Jordan in general, but even applies to a tourist mecca like Petra. I’d gotten cash out of the ATM at the border, but planned to use my credit card to pay for our Petra entrance tickets. Unfortunately, their credit card machine wasn’t working and so I had to use almost all of my remaining cash to pay for our tickets—and then didn’t have cash to pay for the donkey rides (the rest of the story is above). Wherever you cross the border, make an ATM stop a priority (your taxi driver should be happy to take you to one, since he’ll need paid). There are several ATMs in Wadi Musa, just ask at your hotel. And in a pinch, there’s an ATM at the hotel right next to the Petra entrance. Make sure you haggle for things like camel rides, donkey rides, any kind of street vendor. The prices at restaurants are fixed from what I can tell, but it seems like pretty much anything else is up for discussion. Sunscreen and water are the most important! It is hot and there is very little shade once you’re past the Siq. I recommend having something to cover your head as well (I had my awesome head scarf that the guys in Wadi Rum taught me how to tie properly) and sunglasses. Unless you’re going in the dead of winter, wearing cool, comfortable clothes is important. You want things that will breathe well and dry quickly. I still felt like I needed to cover up a little (hence the longer pants) but because there are so many tourists you’ll see everything. I feel like you should be respectful of a more conservative culture, though. Super comfortable walking shoes with a good grip—that stone can be really slippery! Close-toed tennis shoes or hiking boots are best, but sturdy sandals can work too (but you’ll have sand and rocks making their way in sometimes). There are a few options, but they’re surprisingly hard to find and depend on where you are at that moment. There’s a $25 buffet that gets good reviews but when we glanced at it the food looked terrible (it was early afternoon, so maybe it was the dregs). And we didn’t feel like dropping $50 for two people to eat mediocre food. Instead, right across the street kind of catty-corner there is a small, unassuming little restaurant that you may even wonder if it’s open. They did us up a little picnic lunch of fresh, hot falafel, fruit, yogurt, cucumber, chicken salami, pita, and a drink for about $7 that easily fed both me and my dad. There were more choices if we’d eaten there, we were just in a hurry and took it to-go. Most hotels will pack you a lunch if you ask. You can also get drinks and snacks just outside the park (where you buy your tickets), and it’s a bit cheaper. Possibly a controversial opinion, but the Monastery is even more awesome than the Treasury. Don’t skip it (but do consider taking a donkey there and back). You can hire a guide at the Visitor Centre if you want a more in-depth experience of the site. Guides there are well-trained and can give lots of background info and show you great photo spots of off-the-beaten track areas that you wouldn’t find on your own. Don’t bother buying a horse or carriage ride at the entrance, the horses can’t go much past the Siq so it’s a short ride (and you’ll miss the best parts of the Siq flying through it). I do believe a free ride comes with your ticket—you’ll still need to tip—so you could consider taking a ride back up if your legs are tired (my dad did because of his hip). As I mentioned above, I have very mixed feelings on the whole animal situation here (and everyone will have their own opinion on it). The only thing I’ll say is to do what feels right for you, and if you see anyone abusing an animal please report it to the Visitor Centre, the Tourist Police, or the rangers at the park. Jordan is taking a lot of steps to really crack down on this issue and improve the treatment of animals, both at Petra and elsewhere. We stayed at the Sharah Mountains Hotel and it was great, about $50 USD per night. 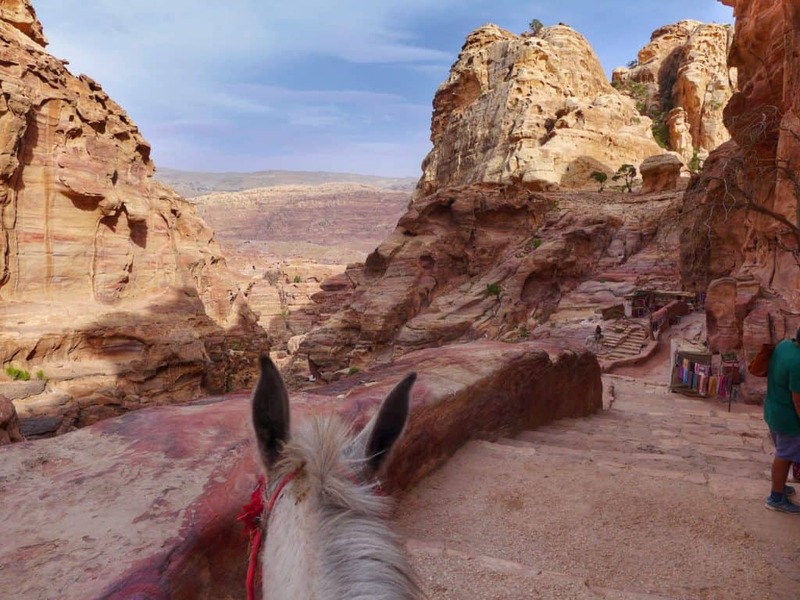 The hotel owner is very accommodating and shuttles guests back and forth to Petra. The rooms are nice and clean, and our dinner was delicious (not included in the price). You have a few options, depending on where you’re coming from, but taxi is easiest. We took the bus from Wadi Rum to Wadi Musa, but it drops you off at a depot of sorts and then you still have to find a way to your hotel. Or you can take a taxi to and from wherever. We took a taxi from Wadi Musa back to the Aqaba/Eilat border, and it cost around $35-40 USD. 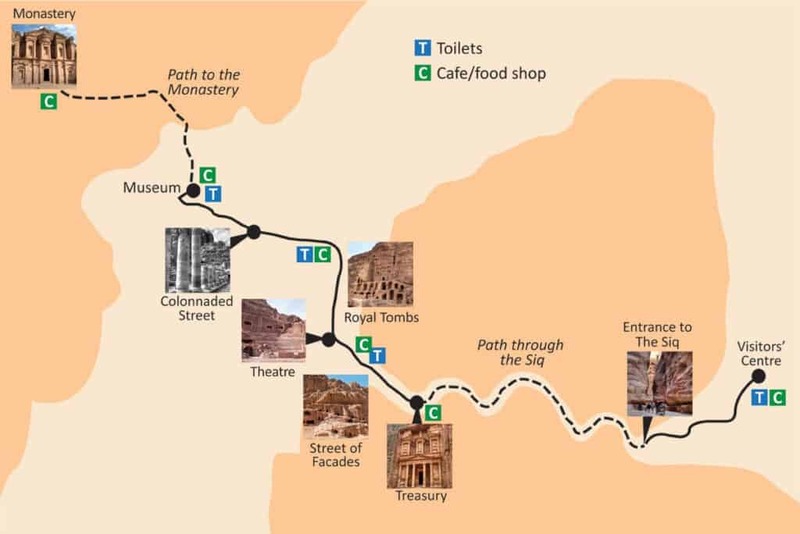 What other questions do you have about planning a trip to Petra? Drop me a note in the comments and I’ll do my best to answer them! OMG! I was enjoying every word of the description of your trip to Petra!! Has been in my bucket list since I was 8. My father’s cousin was a reported and he travel to Jordan and Egypt and show me the black and white photos then. I was in love. History is my passion. Thank you so much for this detail trip. My sisters and I are planning one for October 2018. Question, are contact lenses comfortable to wear, or glasses better…since the dust. I sure hope we will enjoy this trip and ride a donkey or camel 🙂 THANK YOU AGAIN !! …keep on writing about your trips !! Thank you! So glad the post was helpful…it is such a magical and inspiring place! Honestly, I never learned to wear contacts so I wore prescription sunglasses the whole time. For me, wearing regular glasses would have been too bright (my eyes are super sensitive to light), but that’s kind of up to you. I’d recommend sunglasses either way, whether prescription or wearing a regular pair and using your contact lenses. It will protect your eyes from the sun, keep you from getting a headache (from squinting), and also protect your eyes from dust either way. 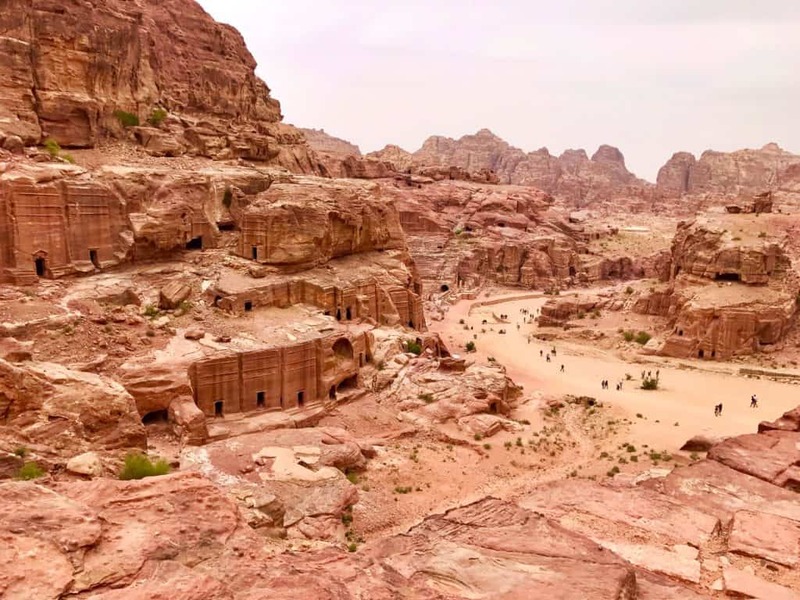 Otherwise I think you’d be okay if you really prefer contacts, unless you’re super prone to getting sand in your eyes…the good thing about here vs. in Wadi Rum is that it’s more sheltered from wind so you don’t have the blowing sand factor. Hope this helps! Thank you for writing such a comprehensive, helpful post. Your pictures are beautiful and your tips are great. Petra is on my bucket list too! Thank you! Happy it’s of use to people. 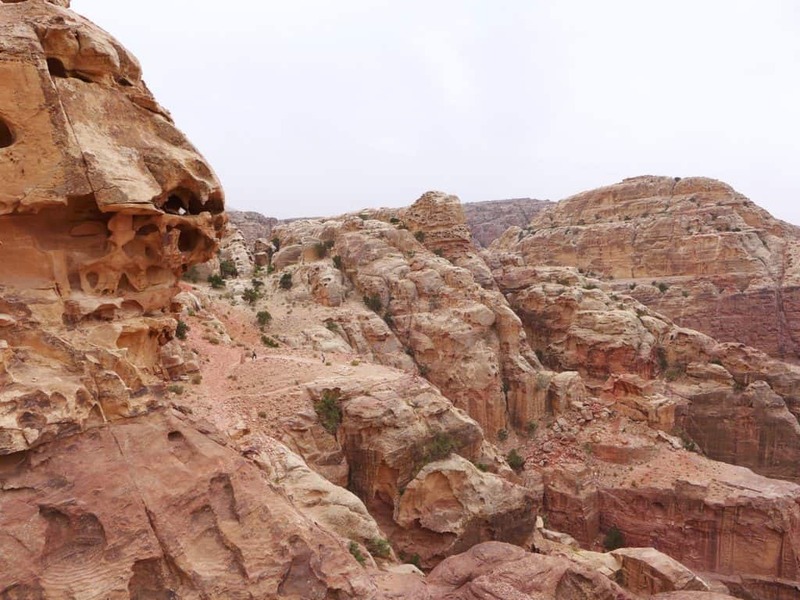 If and when plan your trip, let me know and I have tons more tips, including Wadi Rum as well! Fantastic. My husband hates tours so this provides great info so we can go on our own!! It’s totally doable, and you’ll enjoy it so much! Lovely post! Petra is on my wish list, and I think the night tour looks so amazing. It’s always a treat to see the moon and the stars in such a magical setting. Petra by Night is so magical! Particularly if you’re a photographer, but even just to experience the music and the darkness and the stars! This was such a complete article! I have always wanted to go to Petra, but I haven’t found the chance yet. However, I will definitely take these tips into account for when it happens! I also LOVED the pictures, so beautiful and the colours were amazing! Thanks for sharing your experience with your card. I never know which payment method is the best and it’s hard to find out right on the spot. I was just in a little town in the Netherland and nobody would take cash or Mastercard! They only accepted a local card call Maestro, so my friend had to pay for almost everything and then I would transfer her with paypal. Anyways, I’m glad you enjoyed your trip! Now I am more eager to visit Petra after you article. Safe travels! Thank you! Isn’t it SO frustrating when you end up being out-of-step with the right kinds of payment, and aren’t able to buy things or have to spend half your time looking for an ATM? I hate that!